Football, fun, food and friends are all on the roster for Homecoming 2018 to be held Sept. 21-23 at the University of Guelph. The University has added several new campus events to the annual celebration for students, faculty and staff and alumni. This year’s lineup will include a free community pancake breakfast and an evening concert featuring the Canadian rock band The Glorious Sons. 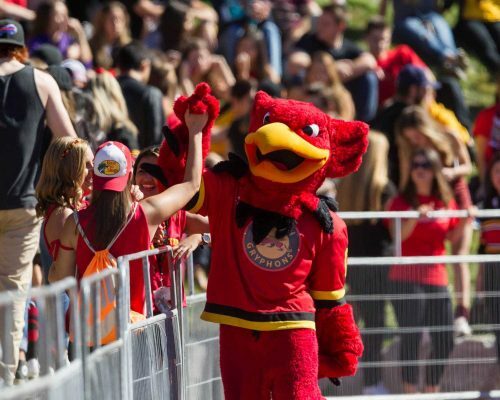 “Homecoming is an exciting time for the University and Guelph community,” said Daniel Atlin, vice-president (external). To ensure that Homecoming 2018 is a safe and successful event, U of G has worked closely with the City of Guelph and Guelph Police Services for the past year, said Atlin. Planning has included improved party registration for students, cleanup initiatives, and information and educational campaigns. More police and bylaw officers will patrol local neighbourhoods than in past years. Free bus ridership will be offered along key routes during peak hours. “The University has a strong partnership with the City of Guelph, and our students are active and engaged community members,” Atlin said. Saturday kicks off with a free community pancake breakfast at 8 a.m. in Branion Plaza, and the annual Glory Bowl, featuring alumni Gryphon football players, at 10 a.m. in Alumni Stadium. A pre-game party hosted by Gryphon football will be held Saturday at 11 a.m. in parking lot 7. The football game begins at 1 p.m. with the Gryphons hosting the Queen’s University Gaels. Country singer-songwriters The Reklaws will perform at half-time. The U of G women’s rugby team will play York University starting at 1 p.m. on Varsity Field, followed by women’s and men’s rugby alumni games. At 8 p.m., rapper Shotty Horroh will open for The Glorious Sons in Peter Clark Hall, University Centre. Numerous sports team reunions will take place Saturday and Sunday. A full itinerary is available online. For tickets and more information, visit www.gryphons.ca or call 519-82-GRYPH (519-824-7974).